Does your trade show strategy include using promotional products? It should, and I’m ready to tell you why, what and how! First, the why. People, in general, love swag. Free stuff! If your marketing plan includes trade shows, fairs, exhibitions and the like, you have probably already witnessed how big the bags are when attendees walk out with their swag. In all honesty, there are people that go to some booths just for the free swag. Maybe they aren’t a potential customer today, but they could be later. Studies have shown after being given a promotional item, people are more likely to do business with that company in the future. For some companies, the inexpensive and easy allure of giving away candy is a strong one for exhibiting. Grab a big bag of candy, throw it in a colorful dollar store bowl and get people to your booth. Great! But what happens when they drop the candy in their bag and get home a few hours later. Do they remember where they got it? Did you know I can put your advertising on candy, mints, nuts and more? It’s going to take a little more planning and a bigger investment. How many more customers would it take for the pay off? Email me, let’s talk about it. Pens are an inexpensive and light way to get your brand out there. Light. Yes, I said it. I know all about dragging boxes of swag, flyers and demo units to shows. I’ve done it myself, and I know you are thinking about it. Here are some other things to consider when buying promo pens: pens that write well are more likely to be used (and seen), pens that have a cool feature are going to be passed around and shown to other people, and pens travel – they get left places and borrowed! Ask me about sample pens so you can try before you buy. Looking for email addresses or phone numbers? Think about including a giveaway that’s a little more attractive but is reserved for attendees giving you more of the information you need. It’s amazing what a branded lip balm will make a weary chapped-lip show-goer do! They will be considering your brand every time they use the lip balm, as well as every time they get your email. So many ideas here, email me to find out more. Prize wheels are another fun way to get attendees to your booth and engaging with your team. Ask trivia questions about your business or industry. When an attendee answers correctly, let them spin a prize wheel. You can customize the prize wheel for each event, and giveaways can have a wide range of promo items on it. I’m happy to help you find a prize wheel and the show stopping giveaways to put on it. You got the attendee to your booth, now what? Your booth staff is prepared to have conversations about your products or services, but sometimes there is a next step. Incent attendees into taking the next step with a promo gift that has a higher perceived value. For example: if in-home appointments are where your business is best demonstrated, give away a nice logo water bottle for appointments set at the show. If an attendee agrees to a follow up appointment at your showroom, gift them with a branded BBQ set. Not only will they be more likely to take the next step towards final commitment, your potential new customer is more likely to follow through with their end of the agreement. I can give you some great ideas to have gifts showcasing to your business. Raffle gifts can really get a deal going and are easily customizable. Here’s where you can do the big giveaway! Set a goal for the event. If it’s collecting business cards for prospecting, raffle off high-quality, customized blue tooth headphones by collecting business cards and drawing a winner from a fishbowl. The higher the incentive, the more likely you are to get an action on your request. Raffles should be done with a goal in mind and driving results towards that goal. I’d love to help you work through the target of a raffle and what goals to strive toward. Email me any time kristin@weareideation.com. Lastly, don’t forget the employees working your booth. Make the right impression with branded apparel. Pick a color scheme or theme for apparel and make a few options available for employees to choose from. They will feel great having had a choice and will proudly wear your company logo with a great looking piece of clothing. Want to incentivize trade show activity to hit your team’s goals? Give your top goal achiever the same gift as the raffle winner. I have more ideas than I can possibly put in this article, besides I don’t want to give you all my secrets in one place. 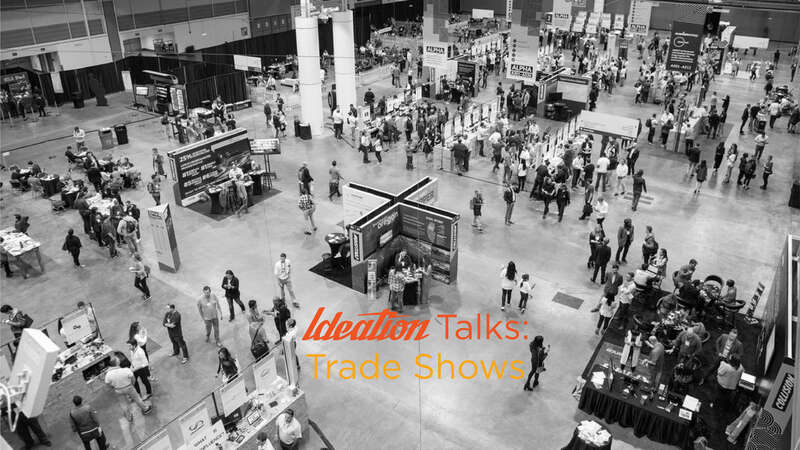 Whether your company is new to trade shows or has been doing them forever, I have ideas and suggestions that can make a real difference in your results. I was a corporate marketing manager for several years and I love doing events, but I also understand the planning and preparation that go into them. It’s a simple process to get started with me, just email me your event date, the event name, your budget, and your company – I’ll work out a promo item plan to help make your next event the most successful yet. Nothing delights me more than a happy client.